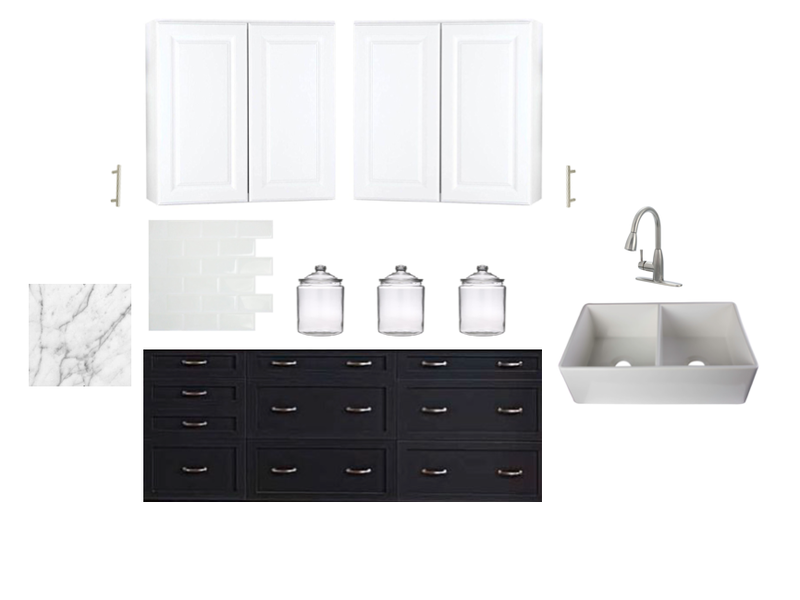 Today I am going to show you the next concept design for our kitchen. This is for the main area. As you probably remember from our previous post the bottom cabinets will be navy blue and the countertops will be marbled. The top cabinets are going to be white with silver handles to bring in the silver from our appliances. Between the bottom cabinets and the top cabinets we have the subway tile back splash that was also shown in our previous kitchen post. I would love to add a farmhouse sink to our kitchen. I love the way they look and think it would really add a dramatic effect. On the countertop I added three glass jars. They are the only thing we currently have in this mock up. I use them to old our flour, sugar and brown sugar. I love that they can be used for decoration and storage at the same time. As I mentioned before the kitchen makeover is going to take quite some time. We plan on painting the cabinets first which I think will definitely change the feel of the kitchen. I will post pics as soon as it happens! What do you think of our kitchen design?